Bring first three ingredients to a boil, remove from heat, and add powdered sugar. Beat until mixed and spread on cake. I'll be adding more recipes as I get the time so keep checking back! My niece brought this to a family birthday. OMG! I had to have the recipe. This is so easy and so good. Enjoy! 2. Spray a 13''X 9" glass pan with Pam. 3. Roll out one roll of crescents in the bottom of the pan. 4. Blend together the cream cheese and 1 cup of sugar. 5. Spread the cream cheese mixture on top of the crescents. 6. Top with the other roll of crescents. 7. Brush the top with melted butter and sprinkle with the cinnamon/sugar mixture. 8. Bake at 350 for 30 minutes or until top is golden brown. Make the cake according to the directions. After it's cooked, and while it's still warm, mix in about 3/4 of the icing. Now, my daughter told me to heat the icing just a bit until it's warm. After it's mixed, form small balls and freeze so they'll be easier to dip. There's a new kind of dipping chocolate where all you need to do is microwave it. I found it where the chocolate chips are in the store. I made orange cake and white icing with white dipping chocolate. You can use different variations though. I heard someone at work talking about a package of Oreo cookies, an 8oz package of softened cream cheese. Blend everything, form balls, and dip. I tried these! (See pic) A word of caution, these are so rich and probably have a gazillion calories. I put most of them on a cookie sheet and froze them, then put them in a freezer bag (so the icing wouldn’t stick to the freezer bag) and put them back in the freezer. These are the easiest cupcakes I’ve ever made and this is what you’ll need. I took Chocolate Fudge Icing (told you it was way too much chocolate!) and added peanut butter to taste. I used about half icing to almost half peanut butter. 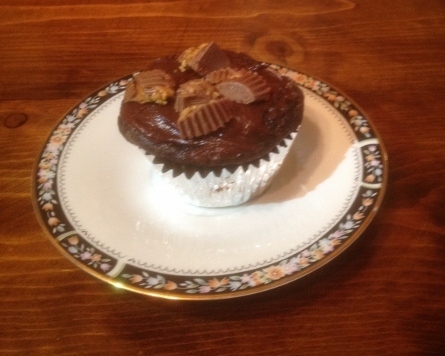 Then I coarsely chopped up miniature Reese’s Peanut Butter Cups and dropped on top of the icing. The Reese’s went almost to the bottom of the cupcake. Not sure how to keep them in the middle. If someone knows drop me an e-mail. I’m wondering if I place them closer to the top if that would work. Next time I make these I’ll let everyone know. Preheat oven to 325 degrees F. Grease and flour a 13”x9” pan. 45-55 mins, or until a toothpick inserted into the cake comes out clean. Cool for 10 minutes in the pan while you prepare the glaze. Combine butter, water and sugar in a small saucepan. Bring to a boil and, boiling for 5 mins, stirring constantly with a whisk. Remove from heat and whisk in ¼ cup Irish Cream. Use meat fork to prick top and sides of cake (go deep). Spoon glaze over top and until the glaze is absorbed. Let. cool and serve. ​​I call this one EASY-PEAZY MEAT DISH because it is soooo easy to do. Place a round steak that has been cut into 4 pieces into a baking dish. Add 1 can Campbell's French Onion soup and 1 can Campbell's Golden Mushroom soup. Add 1/2 can of water to mixture. Cover with foil and bake at 350 degrees for about an hour or until meat is fork tender. Serve over rice.